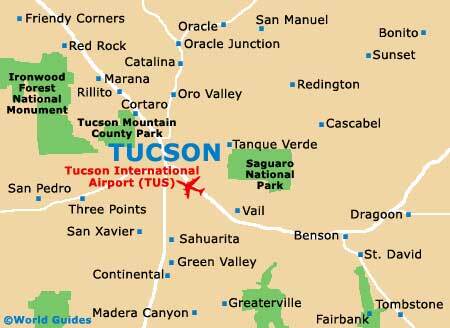 Tucson, Arizona (AZ) contains a good selection of public golf courses and clubs, both near to the city center and also in the suburban areas of Charlotte. With excellent golfing facilities, many difficult holes, fairways lined with trees, golf clubhouses, driving ranges and golf equipment hire, many golf courses in the Charlotte area also provide professional instructors. The SaddleBrooke Mountain View Golf Club is home to a large 18-hole golf course, with a golf par of 72, views of the desert and surrounding Catalina Mountains. Other highlights at Tucson's Catalina include a popular restaurant and relatively inexpensive golfing fees. Located in southeast Tucson, the Randolph Municipal Courses comprise two separate 18-hole golf courses, suitable for all levels of golfers. Attractions at the golf course include a driving range, practice areas, cheap golfing fees and an impressive restaurant. The Sheraton El Conquistador Resort, in northwest Tucson, contains two individual golf courses, the Conquistador Golf Course and the Sunrise Golf Course. Both consist of 18-holes, with a golf par of 72, mountain views and good facilities. Golfing fees are seasonal, being cheapest during the summer. Located on the southwestern side of Tucson, the Starr Pass Golf Club is part of a resort, with an exceptional 18-hole championship golf course and a golf par of 71. Ranked highly throughout Texas, the Starr Pass Golf Club offers seasonal golfing fees, which are reduced in the evenings. Tucson's Vistoso Golf Club can be found at the bottom of the impressive Catalina Mountains contains a highly regarded 18-hole golf course. This golf course is suitable for both beginners and more experienced golfers alike. Standing in the Foothills area of Tucson, the Ventana Canyon Golf Courses offers the public two separate 18-hole golf courses, the Canyon Course and the Mountain Course. With many natural hazards and breathtaking mountainous views, golfing fees are fairly expensive, although resort packages are available.